You are here: Home / Blog / Blog Authors / Reds Posts / Tub Flange-Go Where No Prospector’s Gone Before! Notice how the water gets clearer from tub to tub? 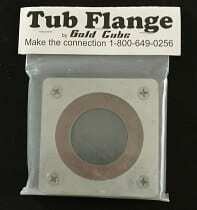 A Tub Flange is a square device that mounts to a tub so a pipe can be pushed through the tub without leaking. The Tub Flange has a rubber gasket that makes a seal around the tube. The tub can be connect to other tubs to provide a series of settling “ponds” allowing for a self contained system. A Tee is used to help keep organics, from entering into the next tub as the sub-surface water is only allow to enter. A Tub Flange System uses ported water and creates little or no surface disturbance in sensitive areas. 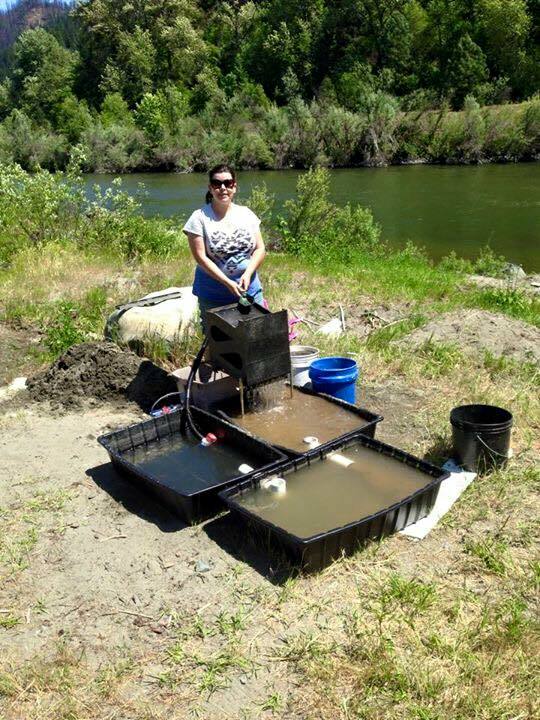 We recommend using three tub system (see photo) for maximum water clarity and extended processing time. By using our tub flanges you are set to go anywhere and efficiently use your ported water. Imagine the side of that tailings pile or, in the Desert, on the beach or just about anywhere you can make a flat spot. These tubs come from a hardware store, and to make this system work even better try adding some swimming pool Flocculant which will settle particles. Now you can test remote areas, that our forefathers only dreamed of.